Making the right decision in the recruitment process is critical to the success of any organisation. The Interviewing, Selection & Recruitment: Principles & Best Practices training course is designed to provide the participants with the skills and knowledge to ensure their interviewing style and practice maximises the success of the selection process. This PROCLAD Academy training course develops the methodologies to successfully perform recruitment and selection assessment, and then explore individual competence of the decision makers. The training course will also demonstrate how to influence organisations to change their approach to recruitment and selection by constructing objective information and presentations. 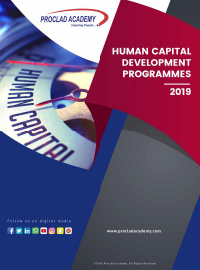 PROCLAD Academy’s Interviewing, Selection & Recruitment: Principles & Best Practices training course will be delivered in an interactive style, using group discussions and case studies, questionnaires and practical exercises. There will also be the opportunity to discuss individual issues on a one to one basis with the facilitator if necessary.